For the past several weeks, there’s been a lot of talk about a large new round of funding that the social startup Tumblr was raising. That culminated today with a report in Fortune with numbers on the round. We had been hearing very similar numbers — around $25 million on a $100 million pre-money evaluation — but it turns out those numbers were likely low, we had heard from sources close to the funding. But while the numbers are still a bit up in the air, we do know that as Fortune and Business Insider reported earlier, Sequoia Capital is leading this new round. And we’ve heard that previous investors Spark Capital and Union Square Ventures are on board once again. Further, like Business Insider, we’re hearing that Sequoia’s Roelof Botha will join Tumblr’s Board as a part of this investment, which will likely close in the next couple of weeks. We spoke with Tumblr founder David Karp earlier today, and while he declined to comment on any of the funding news, he did offer up some other details about the company, and where they’re heading. First of all, Tumblr just opened a new office in New York City. For the past several months they were working at capacity at their old office, with a team of 12. But with the new space that Karp says is roughly four times as big, they’ve already expanded to 16 people now. And they’ll be at 20 employees before the end of the year, Karp says. Given the growth Tumblr is seeing, it’s pretty incredible that they’ve been able to keep up with only a team of 12, but Karp admits that it has been a challenge. And they’re now putting the focus on ramping up hiring to make sure they can keep pace. He expects they’ll be at 30 employees by early next year, most of them engineers, essentially tripling the size of the company in just a few short months. If you’re wondering how they’re paying for this hiring spree, see: above. Karp notes that he worked really hard to keep the team small up until this point, to keep everyone focused, but says that they now have so many directions that they want to go in, that they need more people. One of those is a new Director of Product, Derek Gottfrid, who they nabbed from The New York Times, as we first reported last week. Another new hire is Rich Tong, a co-founder of Weardrobe, which sold to Like.com in late 2009. Tong is Tumblr’s first specialized community director, leading the fashion community. This is a key area of focus for Tumblr going forward as this community makes up a full 16 percent of Tumblr’s most popular sites, Karp says. He notes that in the next few months, a huge focus for Tumblr will be how to better cater to the creative communities they’ve attracted. Fashion, film, photography, these are all hugely important to the platform, he says. Karp believes that focusing on them will help separate them from that other social network, Facebook, which has not done a good job of handling these specialized communities so far. In fact, Karp considers Facebook to be “arguably hostile” towards them. 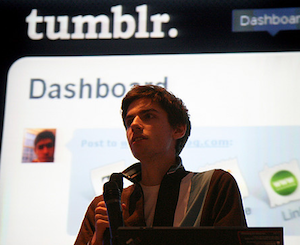 Tumblr wants to be “the best place in the world for the best creative communities,” Karp says. He wouldn’t give any specifics about what they’re thinking about doing here, just that it’s a key area of focus. Karp declined to disclose any sort of revenue numbers, but does say that they’re making a good amount just from the theme community alone. Tumblr currently sells customized themes, created by the community, at a variety of prices. They split the revenues with the theme creators at an “App Store-like split”, but it is a tiered system. The more expensive the theme, the more generous the split is, he says. When the new money comes in, you can probably expect Tumblr to continue to focus on scaling and the product short term, rather than any big money-making schemes, is what I’m hearing. You know, the Twitter model.